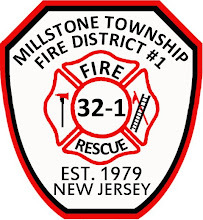 It is the mission of the Board of Fire Commissioners to provide fire protection, fire prevention, and emergency response services to all citizens and property located in Millstone Township. Through incident response, public education, and code enforcement, we will provide the residents of Millstone Township with the highest quality of service possible consistent with the prudent utilization of public funds. We are dedicated to respect, integrity, leadership, and accountability amongst ourselves to insure that our career and volunteer firefighters are properly trained and equipped to serve our community.